I'm sharing this recent research study since it offers some interesting results and insight for multi-channel marketers. It covers an area you don't see discussed so much - the intersection between email marketing and online ad campaigns. Today email is mainly thought of as a customer communications tool for developing loyalty and sales to existing customers, but this study shows how using email as a media buy through ads in email newsletters and in rented lists can help in customer acquisition and conversion to sale. You'll see that the results suggest that online advertising campaigns are enhanced when the email marketing channel is added. It's a classic case of the increasing reach and awareness through adding an additional channel. contact with both campaign channels. The respondents were all members of the Nielsen Online Panel. Responses were split into three samples. The main finding from the study is the relatively high recall from those receiving emails compared to those seeing an ad, plus the maximum recall for combined media. Again, a classic media mix case study. 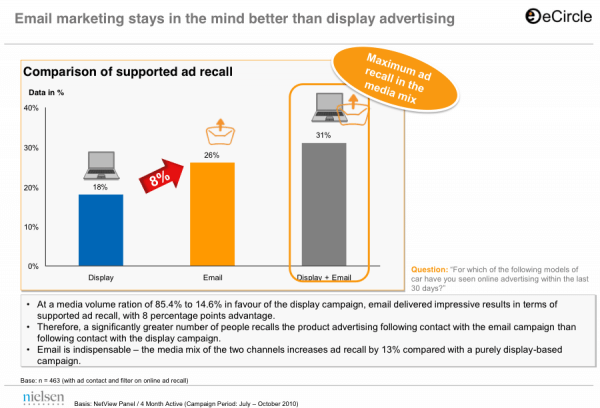 The results show that when the display and email marketing channels are combined, advertising recall improved by 13%, compared to display advertising alone. Email marketing demonstrated an especially strong advertising recall in younger age groups. They also found that this mix was able to achieve four times the traffic to websites and landing pages, with 47% of the sample surveyed showing increased inclination to make a purchase. The combination of these tools is therefore ideal for brands looking to increase their online conversions and ultimately, increase ROI. On the release of the campaigns, the email channel results were markedly better in terms of achieving the required amount of advertising volume. In the first wave of email, nearly a third of the entire email media volume was achieved within a week. When this is compared to the display campaign, results reveal that this only achieved one tenth of the volume in the same amount of time. The main reason email has been so successful here , as we can see from the research, is that the viral effects of the email campaign significantly improved its reach. Opinions of these respondents showed that 42% of email recipients think that newsletter advertising, alongside tailored product recommendations and offers, was by far a better and more trusted way to communicate with them. Aside from the conclusive results, email was able to gain the ultimate upper hand for brands in its ability to reach new potential customers, with nearly half of all respondents stating they would forward relevant newsletter offers on to friends, family and colleagues. 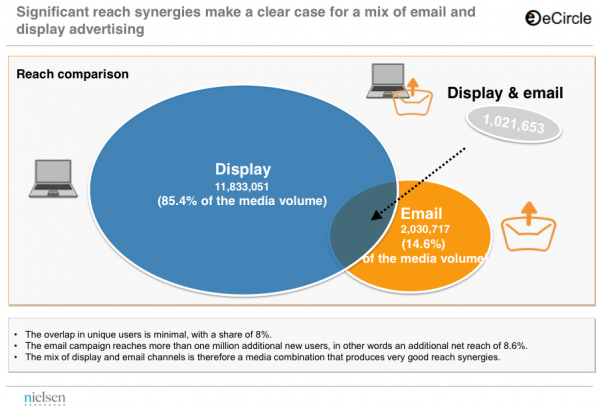 Research on impact of display and email advertising - a case study of SEAT.